Harmony Systems announced the availability of gbTouch 3, another upgrade to the Delora gbTouch iPad music application. gbTouch 3 functions as a remote controller for the Apple GarageBand application program on the Mac. gbTouch 3 includes new features to know and control where you're at in your composition. The dynamically adjusting "LCD" display shows user selectable choice of playhead location or project information, including song tempo. Playhead position and tempo can be changed to specific numeric values. On the Track Details screen, individual track volume and pan are now controlled with faders, and their values are displayed. Graphics have been enhanced and the increased use of icons makes gbTouch more language independent. Besides supplementing the use of mouse and keyboard to control GarageBand, gbTouch also serves as a 'control surface' for GarageBand. The individual track controls - record, mute, solo and volume - and transport buttons on gbTouch are designed to allow the songmaker to adjust and evaluate tracks before heading into the mixing session. gbTouch 3 requires the installation of gbLink 3.0, a small OSX application, on a Mac. 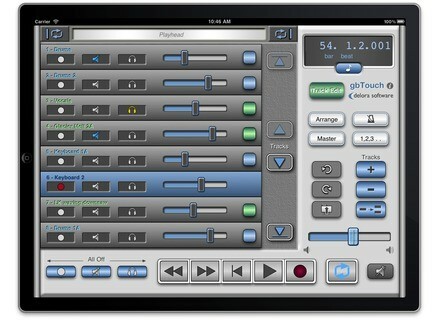 gbLink provides the ability for gbTouch to communicate with GarageBand using a Wi-Fi network. gbLink is free and available for download at the Delora website, www.delora.com. gbLink is OSX Lion compatible. gbTouch 3 is available for $9.99 on the App Store, and is a free upgrade for existing gbTouch customers. Francis Prève Mattel Synsonics Kit Francis Prève has released a free Mattel Synsonics Kit sound library for Ableton Live.